Hi All, Taylor O'Brian here. Sorry for the delay my author has been under the weather. But it's Release day for us here in Sonoma, CA. Check out my next adventure, when we find a dead man in a tank of my friend Tim's best grapes. There are all kinds of strange things going on in town and it's up to me and my kitty Clemmie to get to the bottom of things. 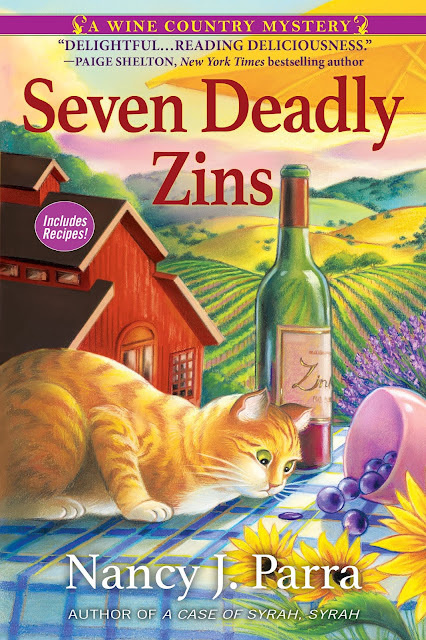 Tell us what you like best about cozy mysteries below for a chance to win a book. Happy Release Day! I love the characters & settings of cozies. I love everything about cosies! The family feeling, the quirky friends, the small towns. I love the festivals, the shops, the cafes. They make you feel like you belong in the story! I love Clemmie's face on the cover! I like the close knit communities. The quirky, sense of fun. I like trying to figure out who dun it. I always enjoy the style of writing/. I love cozies. I like getting to know the characters and learning about different businesses and occupations featured in the storyline. I also like that they are usually series and you feel like you really know the characters.